Gain hands-on expertise in configuring, managing, installing, and implementing networks by N10-005-Live-Lab or Practice Lab. Live-Lab is a real computer equipment, networked together and conveniently accessible over the internet. A live-lab has equipments such as a computer, server, switch or router in it that a user is free to configure. 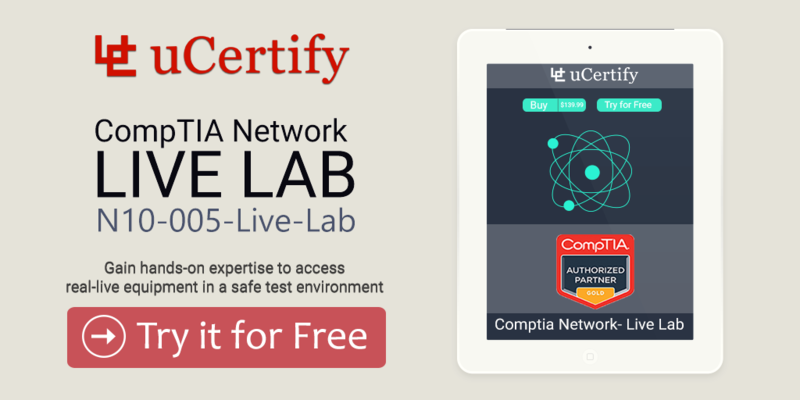 uCertify’s live lab is specifically designed for network professionals, system administrators and technicians involved with setting up and troubleshooting IT networks to improve practical skills in configuring a Network Adaptor, IP Address configuration, ARP & Packet Analysis, IP Addressing Schemes, DHCP Clients and Servers, Routing, TCP and Port Scanning, Certificate Services, Performance Testing & Monitoring, Name Resolution, NAT Firewall, and configuring VPNs.The CompTIA Network+ is a standalone certification from CompTIA with the exam code N10-005. CompTIA Network+ (N10-005) certification exam will provide you with the necessary platform to perform practical exercises regarding configuring a network adaptor, configuring DHCP clients and servers, configuring routing, IPv6 addressing, monitoring and management tools, configuring VPNs and far more.